Triathletes often make the observation that cycling at the Maximum Aerobic Function Heart Rate (MAF HR) feels a lot harder than running at the same heart rate. Due to a common perception that exercising at the MAF HR should feel “easy,” people often ask whether they should lower their cycling MAF HR by ten or twenty beats in order to bring down the perception of effort for cycling and match it to what they feel when running. The assumption is that if exercising at the MAF HR corresponds with a certain perception of effort—or as it is formally called, perceived exertion (PE)—a higher PE must indicate the presence of anaerobic function even though the heart rate is the same. If it feels harder, it must be due to anaerobic function (or more generally, that the body as a whole is working harder). However, this isn’t necessarily the case: As far as the body is concerned, “working harder” and “increased effort” are NOT the same thing. PE measures the power of a particular muscle contraction relative to the muscle’s maximum contractile capacity (a.k.a. its full power). Every voluntary contraction starts as a signal that the brain sends down the nerves and into the muscle. In order to produce a more powerful contraction, the brain must send a more powerful signal. PE is the intensity of this signal relative to the signal intensity required to produce the most powerful muscle contraction. A contraction that takes up a greater percentage of a muscle’s total capacity produces a more intense PE. In other words, PE is your brain telling you how close you’re getting to the muscle’s redline. The requisite signal power coming from the brain. The necessary oxygen and metabolic fuel availability. If a particular movement involves a large portion of the musculature, the body will have to distribute its metabolic fuel out across a wide range of muscles. But if a certain movement involves fewer muscles, the same metabolic fuel can be focused to a much greater degree. When a movement is focused, there is plenty available fuel for each muscle—allowing each muscle to contract at a greater percentage of its full power. 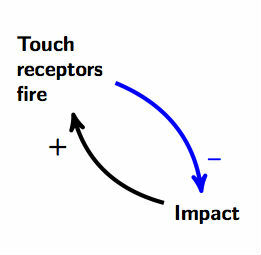 But when a movement is distributed, there is less fuel available to power each muscle. Even if the brain sent out a very powerful signal, the muscle wouldn’t contract as hard as expected because the fuel simply isn’t there. This means that if the body uses the same amount of fuel to contract more muscles, causing each brain signal (and the muscle contraction it provokes) to become less powerful, the PE will be lower. Why? Because PE fundamentally isn’t about how much energy the body (or the brain) is using. PE is the brain telling you what’s happening in the muscle. A good illustration of this discrepancy is the effort needed to pry open a stuck jar lid. Only a few small muscles in the arm and upper body are involved in this effort. The big muscles in the legs and hips are essentially dormant. Because of this, the metabolic involvement (or total brain involvement) is very low—much lower than cycling or running. And yet the PE experienced in opening a stuck jar lid is extremely high. Why? Even though arm muscles are much weaker than leg muscles, they are contracting as hard as they can. The reason this matters for the triathlete is because running and cycling are very different: Running is very distributed, while cycling is very focused. This is largely because running has much higher stability requirements than cycling. A cyclist almost always has 5 points of support: handlebars, seat, and pedals. A cyclist is able to keep the upper body relatively still (merely gesturing to maintain balance) while the lower body does almost all of the work. A runner, on the other hand, has at most 1 point of support: the foot they get to place on the ground each step. For a runner, the upper body has to rotate powerfully in order to achieve and maintain balance throughout every step they run. A cyclist can focus much more fuel into a few leg muscles, while a runner has to make it available across the body. This means that a cyclist’s leg muscles can contract very powerfully in comparison to a runner’s leg muscles—even though as a whole, both bodies are using the same amount of fuel. Therefore, the runner’s PE will be much lower. While a higher PE in a similar activity typically means more work (which takes the body toward anaerobic function), it is by itself not a surefire indicator of anaerobic activity. As long as the aerobic muscle fibers in a cyclist’s leg muscles are powerful enough that they can accommodate and utilize all the fuel and oxygen that the body can focus into them, that cyclist will be able to work at a much higher PE than a runner without ever going anaerobic. In my next post, I’ll answer the question of why a person crosses the threshold from fully aerobic to anaerobic at very similar heart rates even when perceived effort, number of muscles involved, or even fuel utilization changes dramatically. A training logic in 4 basic steps. In recent posts I’ve outlined some of the difficulties that runners face when training—a phenomenon I call the runner’s catch-22: people want to start running, but they either don’t get fast, or they become overtrained and their health deteriorates. This is because running is relatively physiologically demanding: the minimum requirement for being able to run at all is far more rigorous than (say) for cycling. Most of the time, the reason people experience the Runner’s Catch-22 is because they’re physiologically not ready to train for their chosen sport. They need to develop more fitness on multiple levels before they’ll be genuinely ready to begin running. In this post, I provide the basic concepts I use to develop a training plan. This is not just for runners, but for anyone that hopes to increase fitness in a safe, structured, and predictable way. My goal for this article is not just to provide a bird’s eye view of the “how-to,” but also to give the reader a framework to understand why it might not be a good idea to run some race or get into some other sport until certain requirements have been met. To do so, I divide this process into 4 basic steps: Training for (1) the person, (2) the sport, (3) the event, and (4) competition. If you skip one step, you’ll have a very difficult time meeting the next. And the problem isn’t that you’re flaky, or that you’re not an athletic person, or that you’re not determined. No amount of determination will be enough to overcome the fundamental problem: That you skipped a step. Even before you pick a sport to train for, it’s crucial to consider your overall situation: physical, physiological, psychological, nutritional, etc. If you’ve been sedentary all your life, hoping to suddenly be able to run and lift things over your shoulders will be damaging at best and impossible at worst. Take a long, hard look at your particular body: all the muscle imbalances, digestion problems, moods, energy levels. Typically, any body is well-suited for its present activity levels: what, how long, and with what intensity you do whatever it is that you do. But the less activity you do (or that any part of your body does), the harder it is to change. The best strategy is NOT, for example, to become a runner despite insulin resistance or a severe muscle imbalance. You’ll just hurt yourself in obvious and non-obvious ways. Instead, any training program should first address the constraint—muscle imbalance, insulin resistance, etc.—(and eliminate it) in order to bring the body back to a relative baseline of physical and physiological competency. What does that baseline look like? In a basic sense, when you go searching for odd pains, sorenesses, various symptoms of sickness, and you just can’t find any. Keep in mind that while the process of doing so might include some “running” (for example), the fact that you’re “running” doesn’t mean that you’re actively training the running movement, or that you’re explicitly training for the running sport. At present, how (and how much) are you physiologically able to train? In the simplest terms, what is the biggest barrier to growth? Considering the answer to question (1), how can you train to remove it? This is how I start. Deadlifting: The most salient requirement for deadlifting is more transparently understood as a mobility requirement: to perform a clean toe-touch. While standing upright with feet together and knees straight, to be able to reach down and tap your toes with the tips of your fingers without having to strain (read: while breathing continuously). If you can do this, it’s a good bet that you’re going to be able to consistently grow and develop in the deadlift. Running: The requirement for running is more transparently understood as a power requirement: To be able to accelerate into a cadence in the ballpark of 180 steps per minute (spm). This ensures that the critical neuromuscular processes necessary to efficiently maintain the running movement are developed enough to carry your weight. For some people, a cadence as low as 175 spm works just fine. I’ve yet to meet the person who hits peak efficiency below 170 spm. Keep in mind that a cadence of 180 spm is brisk as hell. In order to meet that requirement, your joint stacking (the alignment of your ankles, knees, hips, and shoulders) has to be excellent—and has to stay excellent for the minimum amount of steps that it takes to accelerate into 180 spm. (And that’s just for starters. Maintaining a cadence of 180 spm for any kind of distance is much more difficult). If you don’t have the requisite mobility in a given area (say, you have a hip restriction), movement becomes more awkward. That means you probably can’t produce stability: your abs can’t keep your upper body steady, making it difficult to control the arcs of motion of your arms and legs. So you can’t develop a high level of skill (the ability for your entire body to move in the best possible way given its structure and capabilities). What are the minimum requirements for your chosen sport (mobility, stability, skill, power, and endurance)? How (and how much) do you need to train to meet them? If the deadlifting competition starts at 100 lbs, then you better be able to meet the minimum requirement for deadlifting when loaded with a weight of 100 lbs. What does this mean? 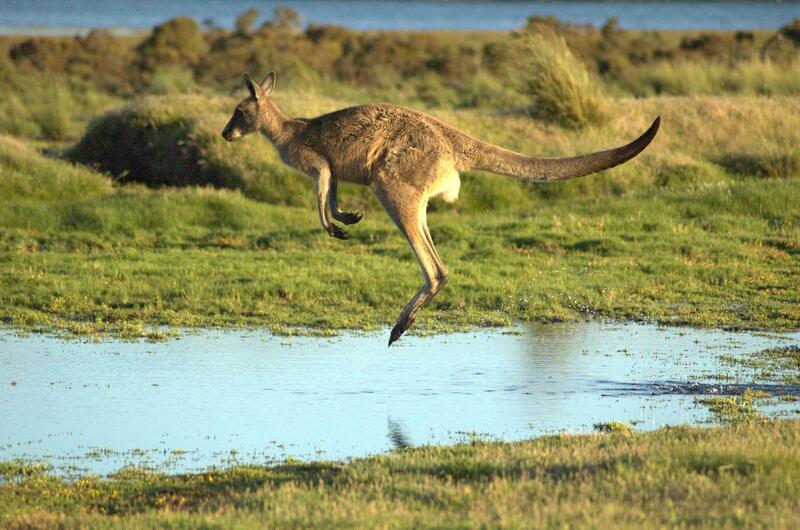 That you have to be able to perform the equivalent of a clean toe-touch—no straining—with 100 lbs on you. It’s similar for running. If you want to run 100 yards, you have to be physiologically capable of accelerating into a cadence in the ballpark of 180 spm for 100 yards. If you want to run a marathon, you have to keep a cadence of 180 spm for the entire marathon. This is why training for the event is s Step 3 in my list (and not Step 1). I’m well aware that a lot of people would like to pick from a menu and “choose” to run a marathon instead of a 5k because they “like” the marathon better. It doesn’t work that way. That would be like a novice “picking” to enter a deadlifting competition that starts at 250 lbs instead of 150 lbs, because they “like” 250 lbs more. For obvious reasons, you don’t do it. What we don’t realize is that distance must be earned as surely as weight. Weight, is volume. Distance, is volume. They may not be the same kind of volume, but they’re both volume. They both deserve the same respect: they’ll both break you (in different ways) if you don’t train accordingly. What are the sports-specific requirement at the planned volume (duration, weight, speed, etc.)? It has nothing to do with being particularly good (that would be “elite-” or “semi-elite competitiveness.” It’s just about being better than the minimal physical and physiological requirements the event requires. Training for competition, then, occurs when you can already meet the sports-specific requirement for the event, and now you want to exceed it. This is also a great way to gauge whether you’re ready for a more demanding event. Once you can hit 190 spm for 100 yards, you’re pretty sure you can train for 200 yards at 180 spm (and expect to make good gains). Same with deadlifting: if you are able to do 2 reps at 100 lbs, you can probably start training (say) for 1 rep at 150. An important caveat: None of this means that the best, or the only way to train is to increase reps first, or increase power first (or whatever). Training is always strategic and multileveled, and you always approach it from as many angles as there are people in the world. The above only means that exceeding the sports-specific requirements at a given event is a decent gauge of whether you’re ready to train for a more challenging event. Can you exceed the event-specific requirements? How (and how much) do you need to train to exceed them for . . . Greater competitiveness at the same event? Participation in a more challenging event? In future posts, I’ll break down these steps further and provide concrete examples of what they look like in training. I’ll discuss how to use the 4 steps together to design a more comprehensive training plan. The role of downforce in forward motion. There are two main camps in the argument of exactly how we manage to move forward as we run. The traditional camp says that the body uses the muscles to “push against the ground.” The other—constituted almost solely by Dr. Nicholas Romanov’s Pose Method—proposes that we move forward thanks to the action of gravity on our bodies. This second camp suggests that what the muscles do—their primary function—is to convert the downward force of gravity into net forward movement. But how is it possible that the body can convert a downward force into horizontal movement? Part of the answer lies in the fact that the running movement isn’t really horizontal. It consists of a wave-like movement of the hips and torso—an oscillation—that only seems to be a straight line if we’ve zoomed out far enough. If your model (incorrectly) assumes that the body is trying to convert a downward force into a force that travels on a horizontal linear vector, you’ll end up quite confused. Let’s get to the issue I want to talk about: Proponents of the idea that runners “push off” often understand Dr. Romanov’s argument—that gravity is the “driving force”—as claiming that gravity provides “free” or “additional” energy (a.k.a. net energy) if we adopt a certain technique. 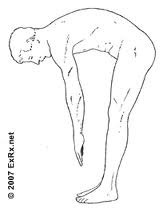 I believe that’s a rather shallow misrepresentation of what Dr. Romanov’s Pose Method has actually suggested. Pose’s main message regarding the action of gravity in running is quite a bit more profound. To explain why this is—and what I believe the main message of Pose is—let’s abstract away from mentions of “gravity” for a second and talk about a more general concept: downforce. Instead of runners, let’s look at race cars. What are the necessary factors in making them go? First and foremost, a race car needs a powerful engine. Without an engine, it’s going nowhere. But an engine is not enough. As any connoisseur of modern racing will tell you, there came a point in the evolution of car racing in which the engine’s ability to turn the wheels exceeded the ability of the best tires to grip the best track. Why? Engine power eventually exceeded the car’s weight (defined as “how much force is generated as gravity accelerates its mass towards the ground”), and the capacity of the tires and the track to covert that weight into friction. At this point, the only way to achieve greater speed was for engineers to somehow find a way to add to the downward force that gravity exerts on the car. How did they solve this dilemma? By adding the ugly inverted wings we now see on the back of every Formula 1 and drag racer: spoilers. By redirecting the flow of air upwards at the tail end of the car, spoilers create another significant downforce. This reveals that strictly speaking, it isn’t gravity that allows race cars to move forward. It’s downforce. (Gravity just happens to be the quintessential downforce on Earth.) But the point is this: no downforce, no movement. The important question to ask about running isn’t really whether one running technique “uses” gravity to run—all running necessarily does so. Let me be even more specific: all overground movement is a result of expending energy in order to convert some downforce into a quasi-horizontal movement. The degree to which movement occurs is commensurate to the degree to which the organism/machine is harnessing downforce in real time. Running according to the tenets of The Pose Method gets you “free energy” from gravity in the same sense that a car that never fishtails also gets “free energy.” In other words, Pose offers the cheapest way, all things considered—speed, agility, endurance, resilience, performance consistency, performance frequency, metabolic flexibility, recovery, longevity, etc.—to convert as much downforce as possible into overground movement. The critical observation offered by The Pose Method, then, is about how the body’s “engine”—its musculature and various systems—work best to harness the force of gravity to produce forward motion. If the car weighs too much for the engine, it stays put. If engine power exceeds grip, it spins out. In other words, car’s absolute theoretical speed limit on Earth isn’t set by the power of the engine, the design and engineering of the transmission, or the materials it’s composed of. The maximum horizontal speed that any object can achieve is set by the theoretical limit to which it can harness the few downforces available to it on Earth. Once the car’s power and engineering causes it to reach speeds at which it is impossible to stop the air around it from supercavitating (creating a vacuum around the skin of the car), no aero kit will allow it to go faster, and no further improvements to the drivetrain will do it any good. Of course, unlike race cars, the human body is not set up to use wind as a downforce—and we couldn’t run fast enough to make it matter anyway. Our running speed is a function of our ability to harness one downforce: gravity. Removing power leaks and other muscle use that does not contribute to harnessing gravity. (The race car example would be to swap in better and better parts, and to make sure that you don’t throttle up enough to drift the car). Increasing top running speed: a runner with good form (a.k.a a runner whose movements and stances maximize the harnessing of downforce) can do so to a greater degree—in other words go faster—than an identical runner whose movements and postures do not effectively harness downforce. Note that #2 is a hidden efficiency: it only reveals itself insofar as the runner goes faster. Both the inefficient runner and the efficient runner may be using a very similar amount of energy at lower speeds, but only the more efficient runner can get to a faster speed. But this observation only holds at lower speeds. If you increase the speed to 160 mph and tighten the curve, my Tacoma would start to spin out or come off the track, forcing me to reduce my speed. In other words, even if you doubled the horsepower on my Tacoma, I wouldn’t be able to match the Ferrari because of its stiffer suspension, better tires, lower profile, and aerodynamic design (in other words, it’s much better at harnessing downforce). I believe that the discussion of “saving energy through the use of gravity” is meant to help us recognize—for starters—that we move forward only to the degree that friction and muscle power meet. It also has a few other implications (to put it mildly), but those are best left for another post. About Pose theory of movement in running. About Pose theory of movement in all sports. About the “unweighing” principle of Pose theory. 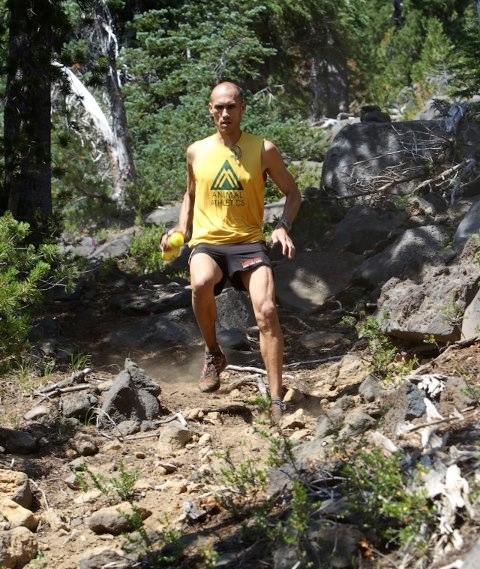 Defining the “long run” for better endurance training. The long run is touted by many to be the centerpiece of training for marathoners and other endurance runners. Most people think of the long run as a protracted effort that causes their body to produce the mental and physical adaptations needed for endurance races. But the ways in which people prepare, fuel, and run during these long efforts are often not the most optimal. And the reason is because long runs aren’t about running long per se—they are about training the particular systems of the body that enable us to run long. This isn’t just wordplay: I often see well-intended runners filling their hydration belts with sugary foods and energy gels in preparation for a long run. Let’s consider which of the body’s systems are designed to help us run a long distance. We need a very abundant fuel source, as well as an engine that can burn that kind of fuel for a long time. Sugars (a.k.a. carbohydrates) won’t be a good primary fuel source: they exist in relatively small quantities inside the body compared to fats. Furthermore, the Type II (fast-twitch) muscle fibers that utilize them fatigue quickly. So we need to rely heavily on a more plentiful fuel: fats. In order to burn fats, we’ll need to use several systems: the hormones that help break down and transport fat, and the Type I (slow-twitch) muscle fibers that can burn them (as well as the lungs, heart, and blood vessels, which together allow oxygen to get to the muscle fibers and enable fat utilization). Running for a long time is all about burning fats. But when a runner depends on sugar to fuel their long runs, as far as the metabolism is concerned, it’s not a long run. Using sugars to fuel the long run means that (1) not only is the quickly-fatiguing sugar-burning engine being used for much longer than it’s designed for, but (2) it’s only being relied upon because the engine that is supposed to do the job isn’t powerful enough to produce the required activity levels. The body is getting tired and worn down at an absurd rate. But that’s also only happening because it was already not capable enough to run that fast for that long. As the body gets tired, it gets stressed. As it gets stressed, it use of oxygen declines, and it starts being forced to consume sugar anaerobically—without the presence of oxygen. This compounds the problem: the main by-product of anaerobic activity—lactate—suppresses the body’s ability to use fat for fuel. What does this do to our definition of a “long run”? I like to define the “long run” as a run that occurs (1) below a threshold of stress that allows for burning fat at a very high level, and (2) long enough that the various systems necessary for burning those fats (and for supporting and moving the body for the duration) become challenged enough to develop. In my opinion, the ratio of fat to sugar utilization necessary for a run to qualify as a “long run” is 42% fats and 58% sugar, a Respiratory Quotient (RQ) of .87. This measure correlates with the aerobic threshold—the highest level of activity at which virtually all of the body’s energy is being processed in the presence of oxygen. While the percentage of fat utilization at this point is already declining, after an RQ of .87 it begins to drop much more quickly. Since the lactate produced by anaerobic activity inhibits fat usage, the percentage of sugar used increases dramatically. You can get an RQ test at any exercise lab, or even some doctor’s offices. But my favorite way of finding a ballpark measure of the aerobic threshold is Phil Maffetone’s 180-Formula. The 180-Formula gives you the heart rate at which you reach your aerobic threshold, which makes it very easy to keep track of your fat utilization while running. Using sugars to support ourselves through a long-run is a self-defeating endeavor. We won’t create the adaptations we hope for. Because the body hasn’t adapted, we’re subjecting it to stresses it can’t really handle. It’s not going to grow that well, or that quickly, or in the direction we want it to, and it might break down on us a few times along the way. Let’s keep our long runs easy enough. UPDATE (10:46 AM, 12/14/15) : I’d previously written that total fat utilization was at its peak at an RQ of .87. A reader pointed out to me that this wasn’t the case. UPDATE (11:35 AM, 12/14/15): I should mention that the criteria I discuss in this article are perhaps necessary but not sufficient to call something a “long run”: Commenter “Van” suggested that a better definition for “long run” is that which occurs at the heart rate which corresponds with the maximum rate of fat oxidation (rather than the maximum rate of oxygen use at which there is no anaerobic function). I’m not convinced at this point, but I’ll be sure to update again—or maybe write a follow-up post—if that changes. Descriptive vs. prescriptive in running. When I read articles about running, I often come across phrases like “no single foot-strike pattern is representative of the entire running population.” True enough, but it doesn’t really help runners: all it does is describe the present state of affairs of the running population. Why is this problematic? Let me give you another example—one that we’re all comfortable with. Let’s suppose that we did the very same research, only about how people lift heavy objects. Statistically, our findings would be similar to running; as researchers, we’d be prompted to say: “no single lifting pattern is representative of the entire human population.” In other words, we’d make our analysis, and see that some people lift objects by bending at the waist, and others lift objects by bending at the hips. In light of this knowledge, let’s review the following statement: “no single lifting pattern is representative of the entire human population. Therefore, no single lifting pattern should be habitually adopted as a baseline lifting pattern for a human population.” This statement seems ridiculous, and kind of insistently missing the point. But we should keep in mind that the reason it seems ridiculous is because we have a clinical standard for lifting heavy objects, namely, to minimize trunk flexion throughout the lifting action. This, of course, doesn’t mean that midfoot/forefoot striking is better than rearfoot-striking (although it certainly sets me up to make that argument). What it does mean is that descriptive observations about a population’s habits tell us very little about what that population should be doing. They only tell us much about what it is doing. And what we do know is that given the stratospheric injury rates for runners, the running population is doing something wrong. We need a clinical standard for running. In order to get one, the first step is to stop interpreting descriptive statements as if they were prescriptive ones. UPDATE: Here are a couple of good articles on how foot-strike could be a function of running speed. This all adds to the question: what should the clinical standard be—which part of our foot lands first? Probably not. But we need a standard. There are a few ideas out there, but I’ll leave that for another post. Leaning forwards to decrease knee pain? What exactly do you mean by that? According to this research paper, leaning forwards during a run may be a way to reduce frontal knee pain, since it effectively causes the body’s weight to be borne by the hip area rather than the knee area. Various potential problems with this advice have been discussed here and here. The problem I see isn’t with the research article, but with well-meaning people using the phrase “leaning forward” as a shorthand for sagittal-plane trunk flexion. 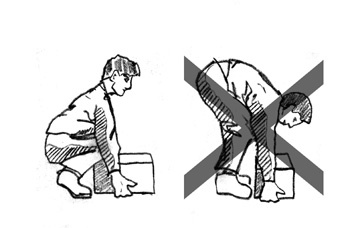 Sagittal-plane trunk flexion isn’t the only way to lean forward: we can also achieve this by lumbar spine flexion. 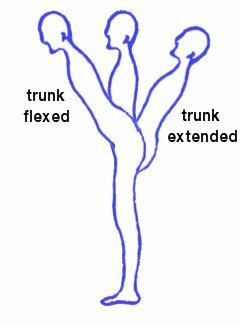 A true sagittal-plane trunk flexion creates forward lean as a function of flexion at the hip, rather than at the spine (think “sitting up straight”). In summary, there are (at least) two possible ways to move the center of gravity forward: at the trunk, and at the hips. Typically, a runner with lumbar spine flexion is compensating for a weak/badly synchronized gluteus maximus/psoas major system—more on this later—with excessive abdominal flexion, thus putting a lot of strain on the back extensors during late stance and pushoff phase of running gait. Furthermore, a person can be in a state of chronic sagittal-plane trunk flexion because of a loss of hip extension, meaning that their hip flexors are so tight that their glutes are weakened. A runner who leans forward because of this problem will typically have strained lower back muscles. The solution isn’t to unilaterally achieve sagittal-plane trunk flexion. The solution is to create it in function of resolving biomechanic problems at the hip. This problem hides a question: How do we give advice that is tailored in such a way that it promotes people to make the right choice biomechanically speaking (flexing the hip), rather than the wrong one (flexing the back)? By changing the angle at which our whole body leans forward, we maintain the same saggital plane trunk flexion while achieving a forward tilt at the hips and ankle simultaneously, because the whole body is in line. Therefore, in my opinion, it’s easier (and safer, in terms of the unintended consequences of our advice) to look at this problem in the inverse: we understand a lack of forward lean not as a cause of knee pain but as a result of hip dysfunction. If we have frontal knee pain, it is likely because we’re not leaning forward enough, and we’re not doing that likely because we have weak hips. 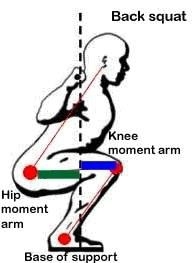 If, with weak hips, we decide the solution is to lean forwards (rather than strengthening the hips, and having the increase in angle be a function of that), then we’ll force a situation where we have to compensate in order to maintain that angle, and the easiest way of doing that is by flattening the lower back—in other words, by hunching forward. The most basic solution to this problem is simple: strengthen the hips and develop hip mobility. (This, however, is not necessarily the whole solution for people who have a more complex gait pathology). Why is this the basic solution? Let’s look at how the hips are structured. 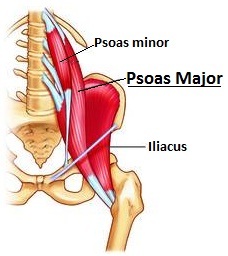 The two most powerful hip muscles are the psoas major and the gluteus maximus. They work in opposition to each other: the psoas major pulls the femur up and slightly to the inside, and the gluteus maximus pulls the femur down and slightly to the outside. The important part is that the psoas major, which anchors to the lumbar vertebrae, also manages to pull the spine down and towards the femur. (This is why you see forward trunk lean in people with a tight psoas major). We can see the interaction in full force in this slow-motion video of Dennis Kimetto’s record-breaking marathon run (although we shouldn’t forget that there are many other muscles at play). Ultimately, it is the correct interaction of all the muscles, and not just the two I singled out here, that will lead to a good running gait. In the video, it is plainly clear how when the gluteus maximus is engaged during the pushoff phase, the erector spinae (along with associated back muscles such as the quadratus lumborum) maintains the curvature of Kimetto’s back. On the opposite side, which is in full flexion, that same curvature is maintained by the psoas major on the front side. Kimmeto’s forward lean is established by a powerful gluteus maximus and erector spinae on one side pulling the leg back, and by a powerful psoas major on the other side, pulling spine down and forwards. This keeps the pelvis tilted forward at all times during the running stride. If Kimmeto’s psoas major wasn’t as effective at maintaining the curvature on the swing side, we would see one of two things happen: he either maintains speed by flexing the lumbar spine, putting immense strain on erector spinae and associates when that leg comes down (and gets hurt at mile 10), or, more likely, his competitor Emmanuel Mutai leaves him in the dust. There is no way that Kimmeto could both (a) not get hurt, and (b) maintain that forward lean without the gluteus maximus and the psoas major working together effectively. UPDATE: I’m working on a post about good, transferable exercises/drills that develop the interaction of the hip flexors and extensors. Muscle strength and running economy — a “chicken or the egg” problem? Runners are often told that strength training is integral to improving running speed and running economy. But there might be a little bit of a problem with this advice. I recently posted about a body of research that pointed to the idea that, for a variety of biomechanical reasons, weaker muscles in a trained runner correlated with a greater running economy (specifically at the calf region). The consensus was that running economy increased with achilles tendon loading, and decreased with calf muscle (gastrocnemius and soleus) activity. More muscle means worse economy. A recent article in Runner’s World confirmed this, citing a study that found that running economy was related to the balance of strength between the anterior and posterior muscles (specifically, the quads and hamstrings). It was not, as most of us suspect, a function of pure muscle strength—overall, competent runners had weaker muscles than novice runners. This brings up several questions. The first is, of course, how can weaker muscles make you run faster? The answer, I believe, is systemic, and our ability to find it hinges on what we mean by “strength training”—and how usefully we’ve defined it for ourselves. In the most basic terms, the strength of an individual muscle has little to no bearing on how the hip-leg-foot mechanical system will function in practice. The power of this system—when power refers to how much force the leg can put out per unit of time—is much more a function of how well the parts move together, than how strong any individual part (or indeed, all of its parts) are individually. Someone endowed with extremely strong muscles that are all just slightly out of sync will have a completely rigid leg, not a powerful one. It’s necessary, therefore, to make sure we all mean the same thing by “strength training.” Strictly speaking, the kind of explosive power (plyometric) training that a lot of runners do, which actually does develop hip and leg power, is “strength training”—but of the entire system. We need to be clear on what we mean by this to know if strength training will actually help us become better runners. Do we mean pure strength, or explosive strength? The second question is more related to a practical matter, and is a consequence of answering the first. What are our reasons to train pure “muscle strength” in the first place? We’d better have them, given the above evidence that muscle strength correlates with low running economy. If we do prescribe a strength training program to runners, are we potentially hurting their running economy? I don’t have an answer for this. Most of my training is either isometric or plyometric, and the few strength exercises that I do—such as barbell squats—are for balancing my body out, more than anything. The third question is a matter of causality: why did the novice runners in the Runner’s World article have stronger muscles? To speculate about this, we have to return to the body of research mentioned above. The reason that weaker muscles correlated with greater running economy has to do with the biomechanics of particular bodies. One of the abovementioned studies looked at the ankle region of highly-trained runners, and found that runners who had longer heels (meaning a greater distance between the ankle and the heel) had poorer running economy and greater muscle power. None of this is surprising, once you think about it. When the hip-leg-foot system pushes against the ground, it exerts force directly into the ground, at a perpendicular angle. 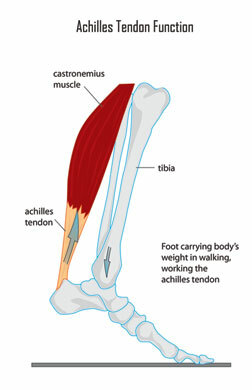 To achieve this, the foot works a lot like a lever: the achilles tendon is connected to the end of the lever arm (the heel bone). When it shortens, the heel raises, meaning that the foot rotates downwards around the ankle—the fulcrum—allowing force to be exerted into the ground. Because every action has an equal and opposite reaction, force also travels in the exact opposite direction: into the calf, parallel to the calf bones. Because of the properties of the muscle-tendon system, this results in a trade-off. If you increase the length of the lever arm—the distance from the ankle to the heel—leverage increases, meaning that the calf muscles have an easier time pulling on the lever and causing the foot to point. However, this also means that the tendons work more like a rope and less like a spring: The elastic fibers that make up the tendon have to be aligned with the direction of force in order to store that mechanical energy. If the lever is longer, the achilles tendon is at a greater angle to the direction of force, and therefore less capable of storing mechanical energy. In other words: greater leverage = less energy return. When your skeletal structure compels you to use your muscles more (resulting in stronger muscles), you also have less energy return, which is a critical component of running economy. The reason that the novice runners in the Runner’s World article have stronger muscles may have less to do with the fact that they’re untrained and more with why they’re untrained. Perhaps one of the reasons is that they are not dimensionally prediposed to train running. Supposing this is the case, you might look at their bodies and find that they are built for leverage, not for energy return. You might. A longitudinal—long-term—study would confirm this (or not). If the untrained runners started training, would their running economy get better? According to the abovementioned study, not really—or at least not completely: the study estimated that 56% of running economy could be accounted for by heel length alone. In addition, the runners they looked at were all highly trained (and had comparable running performance) and their running economy still varied by 20-30%. (This also means that while longer heels contribute to a lower running economy, they do not necessarily contribute to lower running performance. The human body has many faculties, each of which contribute differently to performance. Energy return is only one of them). One thing is clear: as a collective, we need to be a lot more careful with the advice that we give runners. As I mentioned above, what does “strength training” mean, and what exactly are we recommending that runners do, if we make such a suggestion? The skeletal mechanics of the body (let alone the possible interpretations of the phrase “strength training”) means that the same advice given to two different runners can have very different ramifications—or worse yet, none at all.